Actually, three students of the Moroccan Office of Professional Training and Promotion of Work (OFPPT) have won gold medals at the WorldSkills Kigali Africa 2018 competition held on November 20-23, in Rwanda. 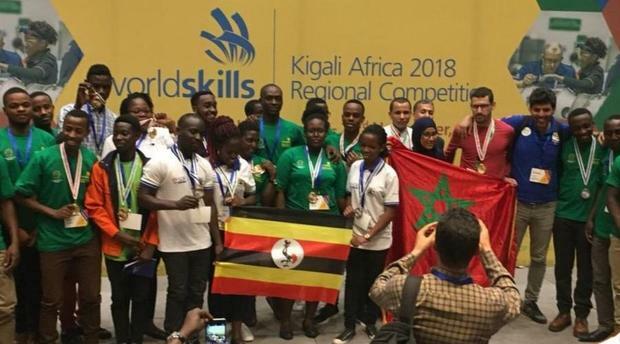 The event brought competitors from Ghana, Kenya, Liberia, Morocco, Uganda, and Rwanda to showcase their skills in seven fields: mechatronics, electrical wiring, welding, plumbing, bricklaying, cooking, and hairdressing. Moroccan students Housna Dakhla and Azzedine Samadi won a gold medal in mechatronics, while Fouad Abdoune won the gold medal in cooking. The WorldSkills experts from South Africa and Sweden monitored a workshop for all participants on the assessment methods of WorldSkills. The next competition will be held August 23-24, 2019, in Russia. Posted by Khalid Al Mouahidi on December 3, 2018. Filed under Zoom. You can follow any responses to this entry through the RSS 2.0. Both comments and pings are currently closed.